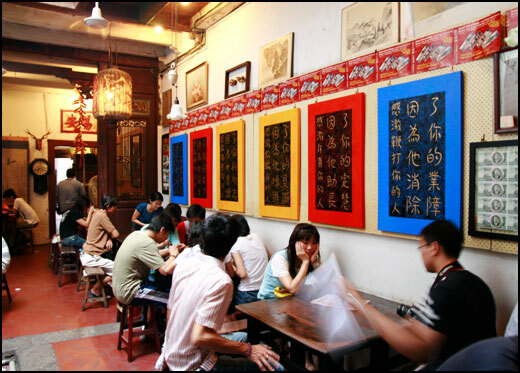 So, you are visiting Melaka, strolling along the famous Jonker Street. Then you get exhausted and sweating from all the walking and sun, wanting to get a place to sit down and enjoy icy cool desserts. Don’t fret! 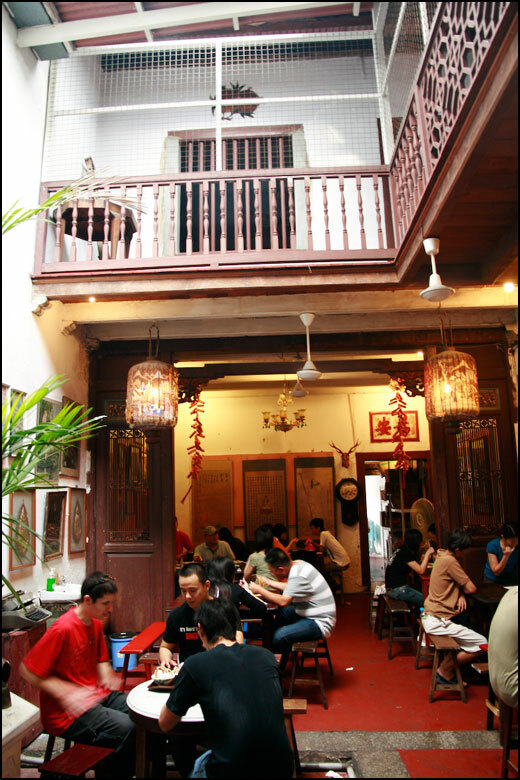 Jonker 88, a self-claimed Museum Cafe located right at the middle of Jonker Street serves some home-made cendol and ice kacang, unique only to Melaka. OK that intro wasn’t really necessary if you have been to Jonker Street, lol. 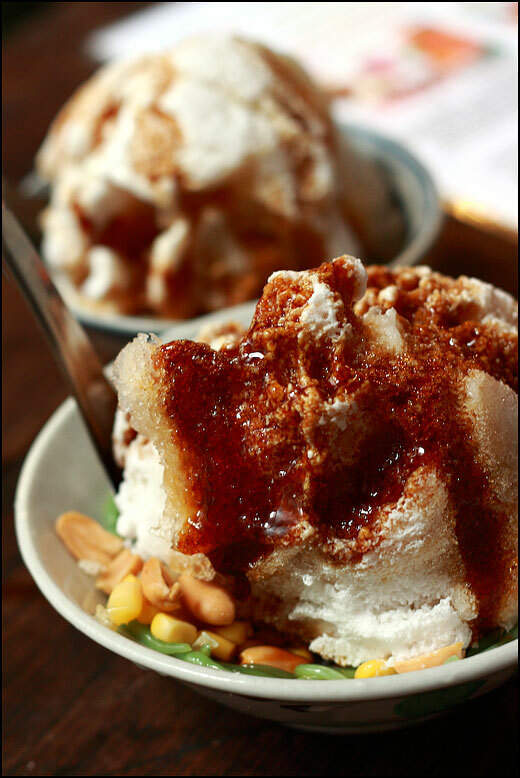 I bet most of you who have visited Melaka already tried the famous cendol and ice kacang right? No? Then do remember to try the desserts in your next trip yeah. That been said, lets proceed with the foooooood. Oops, blur photo! Anyway this is the critically acclaimed Durian Cendol that everyone seemed to love. But dude, where’s my durian syrup? Do you see any? Me neither. Actually the syrup was there (I saw she poured it on the cendol with my own eyes) but I guess I was the unlucky one for getting so little durian love from the lady. Definitely not “durian” enough so I didn’t enjoy, hmmph. So remember to ask for more durian syrup lah. 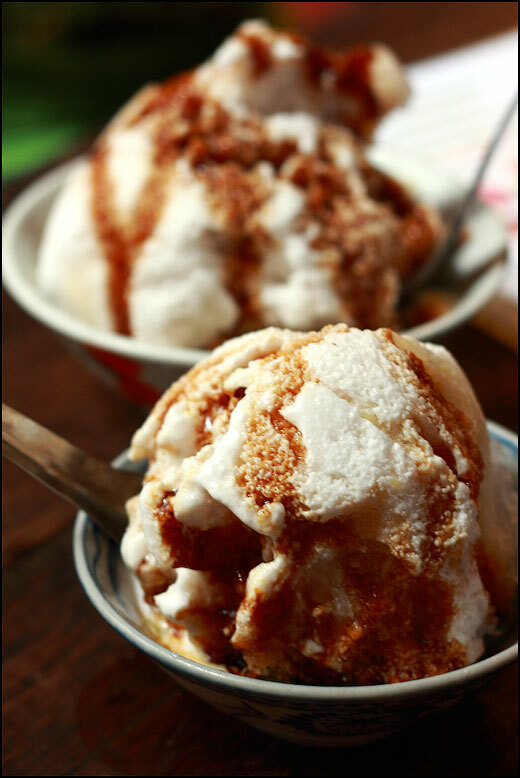 Having no idea what to choose for the second dessert, I simply picked the E.P.C, which stands for Eight Precious Cendol. 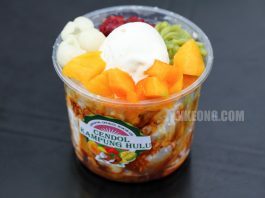 I am gueesing this cendol had eight different ingredients under the shaved ice from its name. Peanuts and cendol are pretty obvious but I didn’t check the rest of the ingredients though. Gula Melaka (palm sugar) and Santan were heavily drizzled on both desserts, but not as much if compared to my first visit 4 years ago. That time, the word “flooded” would be more appropriate, lol. Actually this worked for me because I feel too much Gula Melaka would spoil the cendol for its overpowering taste and oversweetness. Anyway, I have said it before and I will say it again.. 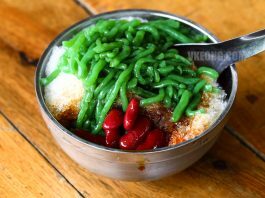 I still like Penang’s version of cendol and ice kacang more, hehe. Self-service is required here for the desserts and noodles. So, you gotta queue starting from the entrance, place your order, wait for the staff to prepare it (remember more Durian syrup!!) and carry it to your table. Which requires you to go through a small door and the massive crowd..
To find yourself with no available tables at all… What I want to say is to hog a table first before ordering lah. 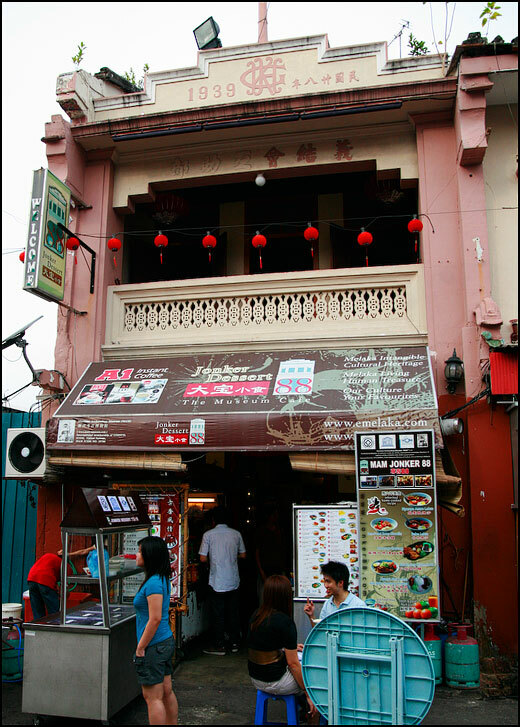 If you haven’t try Baba Laksa before, Jonker 88 is a good place to try. It is basically a noodle in sweet coconut milk soup, served with some cucumber and onion slices, tofu pok and a spoonful of tuna. With the addition of tuna, Baba Laksa tasted like both curry mee and laksa combined in a good way. 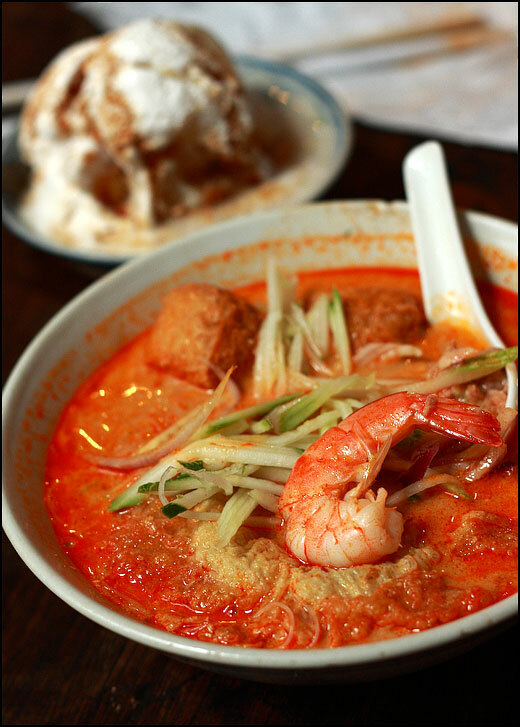 I am sure there are other places to look for better Nyonya/Baba Laksa but that would depend on whether you know the direction to those places. 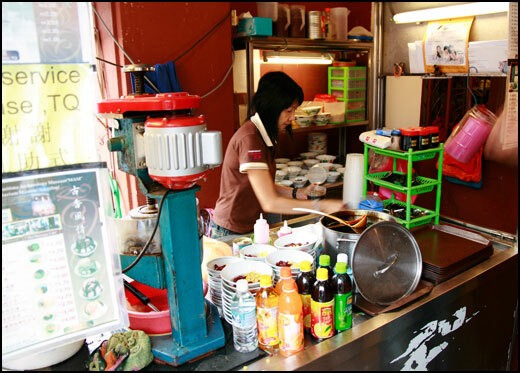 For us, we were in for a short trip and simply did not have the luxury of time to hunt for the best of all food. Can you notice the typo in less than 5 seconds? 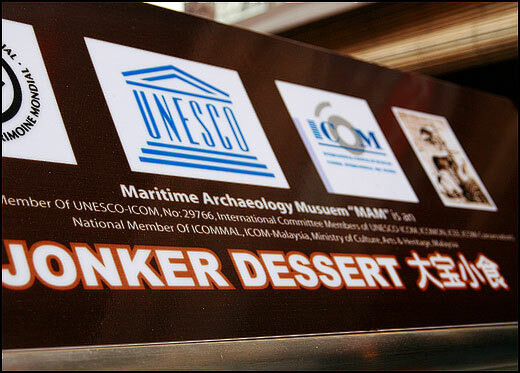 Visiting Melaka wouldn’t be complete without having a bowl of icy cool cendol or ice kacang in Jonker 88 Museum Cafe. Agree?